No other external components or programs are need when you use this converter. The converter includes a powerful DOCX parser and pagination tool used by our TE Edit Control product to offer a cost efficient, feature-rich and robust translator. 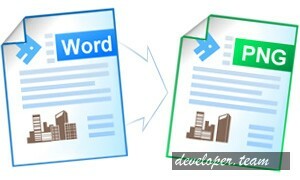 The converter paginates the DOCX file data into a number of print size pages, and then produces Image for each page. This allow for converting large DOCX file into a number of equal size images. Support for complex multicolumn rtf data with positionable pictures. Support for Unicode and right-to-left languages. Support for vertical text in text objects and table cells. Complex table formatting including nested tables. Output Image Formats: BMP, Jpeg, Gif, Png, Tiff, Icon, Exif, and Enhanced Metafile. Set paper size, orientation and margins for Image output. Enlargement or shrinking of output Image. Support for the sequence field which allows for automatic sequence number generation. Improved support for variable-width multi-column sections. Support for adjacent page-number fields. Support for style-linked paragraph numbering. Control on output image resolution. Code Output: The generated Images can be written to a disk file or it can be retrieved in a memory buffer. Support for Unicode text in footnotes.